MS Word & Firefox are the same without the header i.e. just start with the first word. 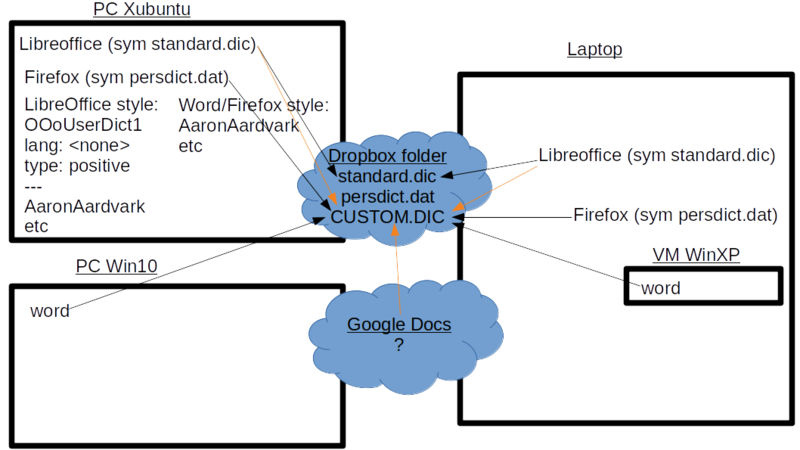 This incompatibility prevents users from being able to use symlinks to cross-sync dictionaries across OSs and programs (see https://i.imgur.com/kVMXXs2.png for schematic diagram of issue). I don't know what the function of the header is, presumably there is one else it wouldn't be there, but would it be possible to allow LO to read/use dictionary files in the more word list basic format, i.e. without the header? I've asked how else to solve this problem (https://askubuntu.com/questions/181003/sync-custom-dictionary-firefox-libreoffice-ubuntu-ms-office-in-windows) and the only idea was running a sync server with custom templates. * more basic, word-list format. Apologies. Semms it has nothing to do with Base, the database-module of LO. Switches it to Linguistic.